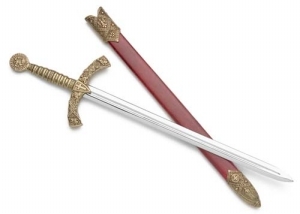 Historic Letter Opener Knights Templar With Scabbard: Our Replica Letter Openers are beautifully crafted with Amazing Detail even in their miniature size. You will find these to be to exact detail of the original items they replicate. They will make an unusual gift for someone or treat yourself to one. Length: 9.75", Blade Length: 7"